Almost two months ago I found out that the 2 1/2 year old daughter of one of my high school friends had been diagnosed with Leukemia. It was a huge shock to me, partially because this little girl is so close to my own daughter's age and I can't imagine what it would be like to have to watch my daughter go through everything that this little girl is going through. I immediately began to try to think of some way to offer help. Seeing as they live a few states away, I knew I couldn't bring meals, clean house, or do any of the other really useful things that I think would be most appreciated. About the only thing I could do is send a gift and perhaps a few encouraging words. In the last week or so I was finally able to come up with something I could make her that I think she'll enjoy. 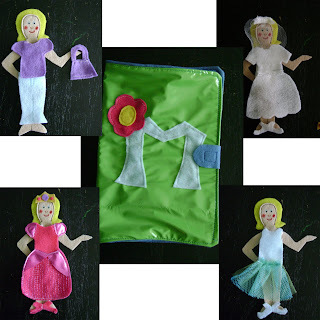 Here is the felt paper doll Dress-Up book. 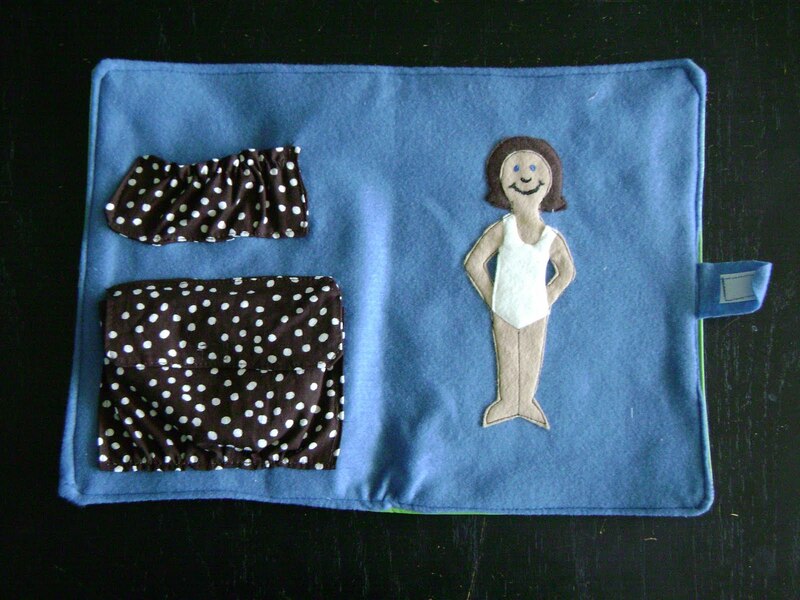 What you see above is actually the one I made for my little Munchkin - I learned my lesson from the felt book and made two this time, one to keep and one to give! I consider this one "the ugly one", because it has so many flaws that I was able to fix as I've made more. Such as, I sewed the felt doll down on this one. That didn't go over so well with my two year old; she wanted to move the doll around. I also have changed the way I did the pockets to hold the dress up clothes, as you'll see later on. I've made 5 books now, all with slightly different outside covers. This one above is just a cotton fabric. 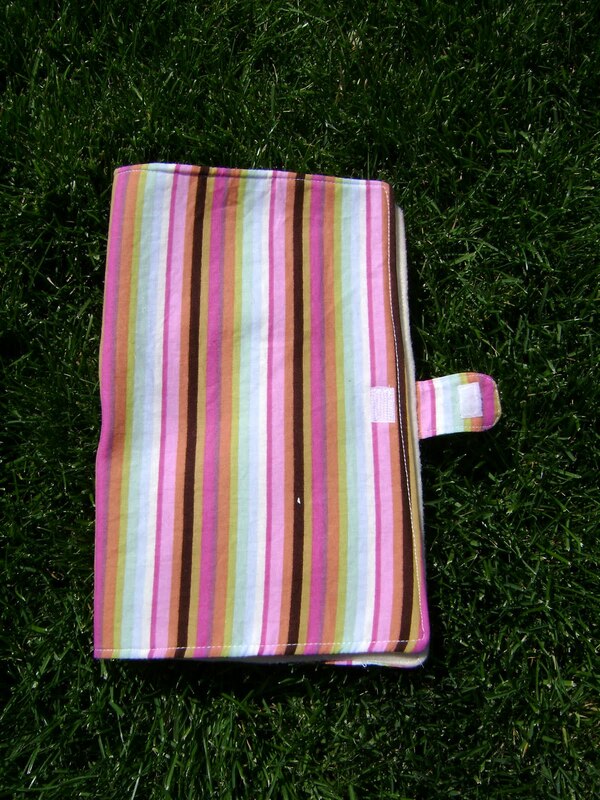 The one I made for my friend's daughter (I forgot to take a picture before I mailed it) was a sparkly pink cotton fabric with "My Dress Up Book" painted on the front (done with freezer paper stenciling). My daughter's is made with lime green pleather with a felt "M" and a flower stitched on the front. I also made two out of a knit butterfly-design and I plan to hand stitch some felt initials on the front. (I didnt bother to take pictures of those ones yet.) All of them have a little flap with velcro to keep it closed (you can see it in the picture above). 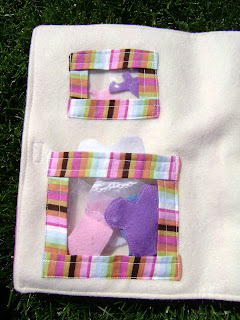 On the left, there are two pockets: a big one for the clothes and a small one for the shoes and other accessories. The pockets are vinyl, edged with the same fabric that the cover was made from. This is the very-revised version of the pockets...if you look back at the pic of my daughter's, you can see how terrible THOSE pockets turned out! I like it with the vinyl, because I feel it makes it easier for little fingers to grab what they want if they can see it. And these are all the fabulous outfits I've created for each book! (Although, I did have to change the ballerina one from blue to pink because the blue tulle I had was too coarse and kept getting stuck in the pockets.) Each outfit is constructed mainly of felt, although as you can see I embellished quite a bit with some odds and ends I had lying around. In the center is the cover for my daughter's book...pleather is kind of a pain to sew, so I told myself I wouldn't make anymore like that, but I have to admit it's kind of my favorite cover so far! So, there you have it. One of the few craft projects I've done lately that is completely my own...no copying, mimicking, whatever you want to call it (although I do try to give credit when I use someone else's idea). I'm considering listing a few on Etsy; I'm just not sure if they would actually sell! We'll have to see I guess. To my amazing friend and her amazing daughter: I hope you enjoy the dress up book (you should have gotten it by now, I hope!) and don't look too closely at all the imperfections. I know its not much, but I hope when you see it you remember and think of all the people who are praying for you. I love this idea! I will be featuring it on somewhatsimple.com on Tuesday, Aug 24th. Thanks for sharing! Found ya from somewhat simple. How creative! I would love to make something like this but I can imagine it took a VERY long time. I hope you list some on etsy - I would rather buy one than spend forever making one. :) Love it! I have to say I am in LOVE with this IDEA! I don't know if I have the stuff just laying around though like you did! How much do you think it cost to make the book? did you sew the doll onto the hair? Did you glue the smaller decorations on or stitch everything? I am wondering if I can brave this.... DO you sell these on etsy? I like your blog so well! I am going to link to it from mine! :) Thank you for the GREAT WONDERFUL IDEA and the beautiful spirit behind it. Thanks Destiny! Making this book wouldnt cost too much, especially if you can get the felt when its on sale. But it did take me quite a while to make...I stitched everything since I have two toddlers with a knack for destroying things and I dont think glue would have been strong enough! You really should! I cheated so badly! My mother n law works at "the Paper Cottage" (scrap booking store). They have wood block cutting out thinga ma jigers... They had a whole "paper doll set"... So my daughter and I spent time there cutting out the felt and now we are decorating and sewing! I am taking step by set photos, but... HAHAH WHO KNOWS how this is going to come out! I really think they would sell well, so many people stopped me and asked what I was doing and there was SO much interest.. I just really want to thank you! Marvelous! Awww! This could be a good idea for little girls. 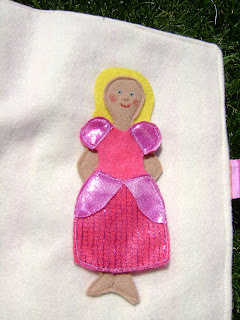 It seems that you are young at heart 'cause you're making a paper doll dress, am I right? 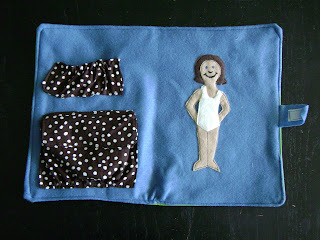 Making any those kinds dolls and even doll clothes are good activities for young girls. They can expand their imagination and creativity by exposing themselves in art activities.